A performance line brought to you by Bella + Canvas, the best-selling All Sport M1009 Men's Sports T-Shirt is great for unifying your team on and off the field in one of 35 boldly colored t-shirts. This shirt has moisture-wicking and antimicrobial properties, making it able to handle perspiration on a sanitary and practical level. 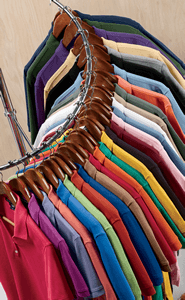 Polyester is known for its quick-drying capabilities, but the specific interlock weave of this shirt is what helps it to draw moisture, release heat, and circulate air away from your body when you are working hard. The antimicrobial treatment in the fabric helps to control odors and stains, allowing you to be fresh longer, even under tough conditions. Set-in sleeves join the body of the garment at a natural point, allowing for regular range of motion when wearing this tee. This lightweight and versatile shirt also comes in a wide array of sizes, ensuring everyone on the team will be uniform.